Lauren Chattman, former pastry chef and author of Cookie Swap! 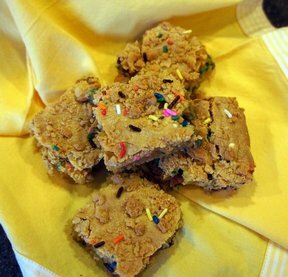 (Workman, 2010), combines the ease of a brownie with the flavors of the all-time favorite chocolate chip cookie in this blondie. 1. Preheat oven to 350°F. Line 13x9-inch baking pan with foil, with ends of foil extending over sides of pan. Spray foil with no stick cooking spray. Mix flour, baking powder and salt in medium bowl. Set aside. 2. Mix butter and brown sugar in large bowl until well blended. Add eggs and vanilla; mix well. Add flour mixture; mix just until moistened. Stir in chocolate chips and walnuts. Spread in prepared pan. 3. Bake 30 to 35 minutes or until toothpick inserted in center comes out almost clean. Cool in pan on wire rack. Use foil handles to remove dessert from pan. 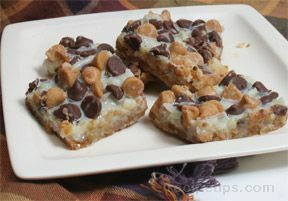 Place on cutting board and cut into bars.Storage Tip: Store blondies in airtight container at room temperature up to 3 days.